There has been a lackluster start into this week of CX trading. Both bitcoins and Alt coins are seeing sideways action and relatively slow overall activity. Bitcoin itself is stagnant against the US dollar, sitting around $377 at the time of this writing. The slow start is not much of a surprise after partly explosive action in selected Alt coins early last week and during the previous weekend. Markets appear to take a breather to digest some of this action and consolidate at less spectacular price levels. Recent Altcoin Rally Running Out of Steam? Alt coins have significantly increased in price across the board (as reported earlier). This impressive rally appears to be slowing towards the end of the week, and much depends on weekend trading activity now to show whether or not the recent run is coming to an end. With Bitcoin holding steady throughout the week, the “silver effect” for Alt coins may be less of an incentive for Crypto coin investors to continue piling up on some Alt coins even more, although there is still particular potential for Litecoin specifically. If Bitcoin’s price continues nicely along its trend line, then Alt coin prices may take some sort of a breather until there are fresh price impulses across Bitcoin and Alt coin markets. The impressive runs in both DOGE (Dogecoin) and EAC (Earthcoin) appear to have subsided for the time being, particularly in light of Chinese exchanges BTC38 and Jubi having now “done enough pumping” and returning to normal. Still, dogecoins are holding on to much of their gains, albeit below the impressive highs of 138 satoshis posted over the previous weekend. Investors wishing to participate in similar gains might want to wait for LTC (Litecoin) to advance further against Bitcoin or look out for previously quiet coins such as DOGED (DogecoinDark), MINT (Mintcoin), or AUR (Auroracoin) to gain some speed. In a report released last week, Europol reports that there is no evidence of any “Islamic State” terrorist financing activity with bitcoins or any other Crypto currencies known as Alt coins. Little wonder so, one might add, because Bitcoin is, in fact, not an “anonymous currency” at all but a pseudonymous *) and wide-open technology where transactions can be monitored publicly. How Bitcoin should ever have been dubbed “anonymous” is beyond comprehension, unless it stems from mass media ignorance and the way mainstream journalists use to “research” their facts and details. Europol’s report indicates that at even IS terrorists appear to be more knowledgeable when it comes to latest developments in technology than the mainstream media. Using a wide-open technology like Crypto coins where Blockhain or Block Index entries are open to inspection by anyone might not be such a smart idea when clandestine business is what’s on one’s mind. The official findings in the Europol report will hopefully help Bitcoin and all other Crypto coins to finally get rid of unfounded accusations of being “terrorist financing vehicles” or some “dark” or “suspicious” tools once and for all. Major Alt coins have have been posting solid, sometimes even dramatic, gains across the board during this last week of CX trading (Crypto exchange trading, as opposed to “foreign exchange” or FX trading). This development comes on the back of a failed attempt by Wall Street big banks, the World Economic Forum, along with the mainstream media and their limited understanding of peer-to-peer and Crypto in general to first claim that Bitcoin had “failed” and, when that did not work, that Blockchain functionality was “useless”. Despite (or because of) those desperate attempts to fight the uncontrollable Crypto coin phenomenon by way of psychological warfare, the price of Bitcoin and other Crypto coins that initially took a brief hit has soon recovered. In the case of Alt coins, prices have even been massively increasing and — as a result — look a lot more promising now than they have over a prolonged period of time. 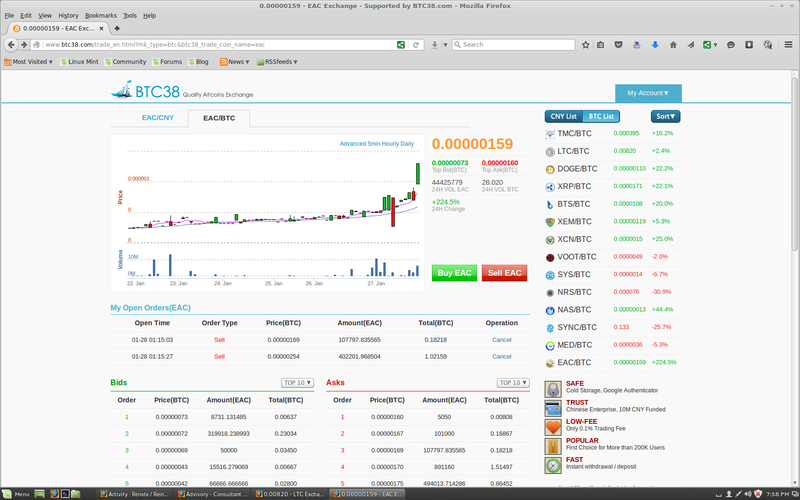 Starting with extraordinary price gains in EAC (Earthcoin) ten days ago that saw the price of earthcoins come up from just 16 satoshis (BTC .00000016) to over their previous all-time high of 29 satoshis, Earthcoin is currently posting trades in the mid-eighties on BTC-38. Even more than that, popular Dogecoin has literally exploded to 139 satoshis (BTC .00000139), up from the 45 satoshis to 48 satoshis area in less than 48 hours on high trading volume. 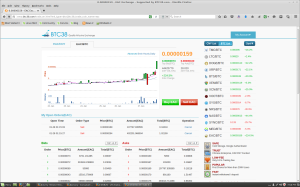 As of this writing, the latest DOGE price is 117 satoshis (BTC .00000117) on Bleutrade. Other popular Alt coins like LTC (Litecoin), NMC (Namecoin), or PPC (Peercoin) have also significantly increased in price during the first part of the week with litecoins at 839,000 satoshis (BTC .00839000), namecoins at 112,000 satoshis (BTC .00112000), and peercoins at 120,000 satoshis (BTC .00120000), all of them up between 2% and 5.8% in just the last 24 hours. These price increases come on the back of continuing dramatic losses on Chinese stock exchanges (Shanghai down another 11% yesterday) and increasingly bleak economic news out of China in general (a higher-than $1 trillion drain of capital out of China has been reported just on Monday). Whether or not these are fundamentals that are affecting Crypto coins as “alternative investments” for Chinese traders is not yet clear, but might turn out to be at least one driver behind latest price action. The Alt coin price increases might also be attributed to technical factors or the overall price increase in Bitcoin seen over the last few months. We will keep watching upcoming movements in order to continue and analyse Crypto coin prices and keep CX traders informed. There have been surprising “news” of Bitcoin’s alleged failure. Headlines of the virtual currency’s “failure”, pending “breakdown” and subsequent “expected disappearance” appeared all of a sudden and without any authentic news content last weekend. Although Bitcoin’s price, indeed, broke down and fell from $457 to $368, it soon became clear that reports of Bitcoin’s death were greatly exaggerated and that the “news” have been fabricated by some sore loser in New York, apparently for mainstream media news outlets. Another piece of proof that Bitcoin cannot be controlled or manipulated effectively, however sinister or well thought-out — or not — any criminal conspiracy to that effect may happen to be. Dogecoin is the original fun coin. To this day, DOGE still is one of the very few Crypto coins to have a proper and full range of accessories available, from wallet software for the widest range of operating systems, to paper wallet generators and paper wallets with great layouts, to tipping solutions, social media integration, and lots more. DOGE prices have been what one needs to call “healthy” for many years now, something one cannot necessarily say of many coins. What’s more, DOGE’s popularity actually makes this one of the select few coins to have something of a REAL economy behind it. DOGE is accepted by many payment processors (on top of roughly ALL Crypto coin exchanges as well). Last year’s decision to peg Dogecoin’s mining to Litecoin may or may not be a good thing. At least that decision has not damaged DOGE or the overall popularity of Dogecoin as of this writing. If it helped achieving the hoped-for results is not widely known either, but maybe the Devs could shed some light on that. Either way, Dogecoin continues to be one of the most successful and popular coins which is something not even originally intended by the coin’s developers. (Dogecoin was originally intended merely a s joke.) Due to excellent underlying technology, the coin took on a life of its own. Using Dogecoin is flawless, using Dogecoin is a lot of fun, confirmations for dogecoins are blazing-fast, and no one is known to ever have had any technical issue whatsoever with dogecoins. Several spin-offs like Dogeparty, DogecoinDark and others will only help developing DOGE itself as well as the entire Crypto coin space in the future. This may be likened to what Formula I racing does for overall vehicle development in the automobile industry. There’s much more to come, and it will be “many fun” to watch this success story developing further as the age of Bitcoin, Alt coins, and the overall peer-to-peer economy continues and matures. The year 2015 has been full of events for Bitcoin and the overall development of Crypto coins. With a lackluster start which is widely seen as the aftermath of Bitcoin’s price peak in late 2013 and subsequent correction and price consolidation throughout all of 2014 and parts of 2015, the latter part of the year looked a lot more promising. After initial price slumps and a suspected hard floor around the $180 level, the actual stability of that level has confirmed that Bitcoin’s price is not likely to fall without limitation but due to millions of participants and increasing use worldwide has matured to a degree where there will always be demand for the Crypto currency to support prices — first signs of a true economy having developed around Bitcoin (and other Crypto coins as well). The holding of the $180 level helped return confidence in Bitcoin as well as leading Alt coins and led prices to a steady recovery. The use of Bitcoin by Virgin founder Richard Branson to pay for a new Virgin Atlantic aircraft was just one of the more exciting developments in the Bitcoin sphere. It helped demonstrating Bitcoin’s overall characteristic as an innovative and also economical way of doing serious business — Branson’s airline is said to have saved millions in fees on just that one large transaction using Bitcoin instead of costly and outdated SWIFT services. In other news, large media outlets reported that Europeans sought shelter in both gold and bitcoins. The latter would add an interesting angle to the overall Bitcoin and Crypto coin market. While precious metals continue to be the ultimate safe haven and only gold and silver are proven tools for storing value, it may or not be true that bitcoins and other digital currencies could be utilised in that process. It is generally recommended to rather use bitcoins for transactions and gold and silver for long-term storage of value but Bitcoin’s transactional advantages might even be part of such a strict Asset Protection strategy for the in-and-out movements of safe-haven investments (or in fact, many other asset classes as well). Finally, the year 2015 saw further initiatives to promote the acceptance of bitcoins for regular point-of-sale use. The Island of Jersey is one of the better examples of a campaign to understand and get started in both Bitcoin and other Crypto currencies. Bitcoin price developments throughout late summer and autumn 2015 suggest that the longer-term outlook for this and other established Crypto currencies may be a solid and consolidated increase toward the next price target, the 50% level of the long term price movement that began with the $1147 peak of 2013. Whether or not necessary short-term corrections will appear to be painful greatly depends on overall economic developments outside the actual Crypto coin sphere. While violent downward moves are always reported as a bad thing by the mainstream media and also abused by incompetent politicians demanding price controls as an “answer”, it tends to be forgotten that this is not necessarily correct. Any price movement, whether up or down, provides trading opportunities. Media stupidity and political propaganda will not change that. Less dramatic price action would be beneficial to Bitcoin’s mass appearance — and hence wider acceptance and use — and might speed up this ingenious invention’s success though as it saves both time and energy educating politicians, “experts” in the media field, or the readers and watchers of mis-information to the obvious: that free markets always are balancing themselves and that Crpyto coins are now an integral part of free markets beyond government control. That said, early 2016 is likely to see relatively slow Bitcoin price increases, if current short-term reversals stay within their expected bands. So far, Bitcoin’s price seems to have “played by the rules” (not of governments but technical analysis and free markets, that is). December has seen textbook price movements in Bitcoin and other Crypto coins and appears to confirm the view that Bitcoin has significantly increased its user base throughout 2015. As most any foreign exchange trader knows, that in itself would point to less violent price movements and possibly an overall subsiding of Bitcoin’s infamous volatility of the early days. The price of Peercoin, the first environmentally-friendly proof-of-stake Crypto currency, has increased substantially during the second half of December. Peercoin’s price recovery is as substantial as that of Bitcoin itself with peercoins having had all-time lows around just 21 US cents. Peercoin continues to be an alternative to Bitcoin itself, being the first coin to solve Bitcoin’s notorious problem of wasting electricity for Bitcoin mining as well as not being susceptible to Bitcoin’s infamous weakness against “51% attacks”. After PPC, there have been other proof-of-stake Crypto coins repaicing power-intensive mining with much more eco-friendly “minting”, the most popular and successful of which is Mintcoin (MINT). While most Altcoin prices can fluctuate heavily and can form patterns of their own against the one of Bitcoin, the recent upward move of Peercoin appears to be related more to Bitcoin’s overall price increase against the dollar and Crypto coins, in general, regaining more traction as acceptance rates increase. It will be interesting to watch these prices into early 2016. The price of bitcoins in U. S. dollars has been increasing steadily and solidly in the run-up to Christmas. While prices never move linear in only one direction and price fluctuations, or prices “taking a breather” are a possible and — indeed — normal to happen, the recent move of Bitcoin may well be part of a larger upward move to roughly the $650 to $660 area. After its record highs around $1147 in late 2013 and subsequent downward period, the Bitcoin price is expected to post a half-way or 50-percent-level mark as its next bigger target. That mark would be around $658 and appears to be the medium-term target at the time of this writing. Whether this will be a smooth ride or a rough one remains to be seen and depends not only on technical indicators but also on fundamentals outside the Crypto coin world that could trigger the next moves and finer-grained steps along the way. Europe continues to be a hotspot for Bitcoin opportunity. Despite all those “warnings” and misrepresentations by a totally clueless EBA, European countries themselves continue to be mostly Bitcoin-friendly. Many have established rules the Bitcoin industry can reasonably rely on. Most notably, Germany, France, Switzerland, Austria, Denmark, the Netherlands as well as the three Baltic states have developed into “very Bitcoin-friendly” places. On top, if a European country happens to be less than what you expected in Bitcoin-friendliness, then in comes that general rule of freedom to do business in all of the EEA (European Economic Area, which includes not only the EEC or EU member countries but also the additional EFTA countries plus Switzerland), and an affected Bitcoin business would be able to re-locate to another member country offering “greener pastures”. Still, this business and innovation-friendly situation should not be taken for granted either: it is something to be cherished and to be defended against possible future deterioration. Particularly during the early Bitcoin years its significance is not to be under-estimated, for it allows Bitcoin “room to breathe” and develop largely unhampered by needless bureaucrat intervention.